It goes HOW FAST?! This set of 16 task cards features fun facts about some of the world's fastest cars, while helping students practice finding speed, distance and time using ratios and proportions, or in science, manipulating the speed formula. There are two sets of answer documents to help differentiate the activity. 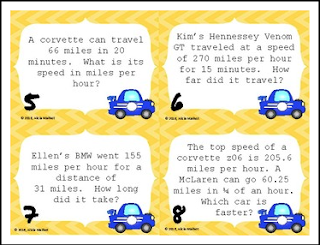 One set has the proportions already set up for your learners who may be struggling, or still not sure about how to set up proportions for word problems. Decimals and fractions of an hour are also included for an extra challenge. I am happy to offer this product for free, please leave feedback if you enjoyed this product!